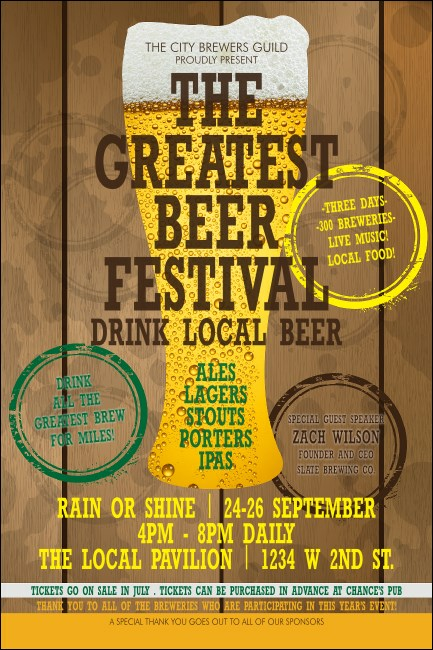 Get the perfect recipe for your pre-event advertising brew when you print Beer Festival Posters and post them in advance. This Poster template features a tall, frosty and ready-to-drink lager on a wooden plank background, along with thirty lines of text that you can customize with your personal event details. Measures approximately 11.46" x 17.18"
Quench your thirst for great advertising at TicketPrinting.com.